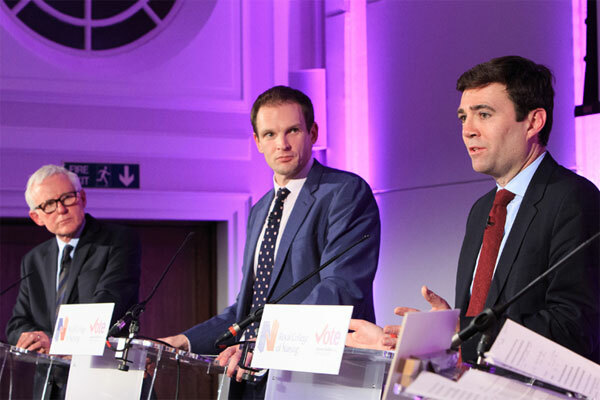 Health minister Dan Poulter failed to commit to the future of nurses’ unsocial hours payments at a lively political hustings event at the RCN last night. At the college’s headquarters in London, Conservative MP Dr Poulter was quizzed along with Labour’s shadow health secretary Andy Burnham and Liberal Democrat care minister Norman Lamb on the future of the NHS ahead of the general election. In August, Dr Poulter wrote to the NHS Pay Review Body (RB) asking it to review how NHS staff are paid for working evenings and weekends, including potentially scrapping out-of-hours payments altogether. The RB will report in June. After being pressed by debate chair Jane Hughes, the RCN’s head of external affairs and campaigns, for a commitment not to ‘attack unsocial hours pay’, Dr Poulter said he would not cut nurses’ pay. But he added: ‘We need to have contracts that work for patients. Dr Poulter said a Conservative government would be committed to keeping the NHS free at the point of use and it would invest in the technology and training that staff need. He said his party has provided 6,000 more nurses on wards and it has committed to increase spending on the health service in real terms every year. ‘We will make sure we free up the money for care. We will improve procurement and estates management and make sure we improve the efficiency of how the NHS is run,’ he added. Mr Burnham said if Labour enters government it would repeal the Health and Social Care Act, recruit 20,000 more nurses and have a year of care budgets to join up health and social care for patients. Mr Burnham said the NHS could not ‘take five years like the five years it has just had’. The Lib Dems is the only party to commit to plugging the £8 billion funding gap in the NHS identified by NHS England chief executive Simon Stevens in his Five Year Forward View, said Mr Lamb, and his party would provide ‘genuine’ equality for physical and mental health care in the NHS. He added: ‘Quite often the culture in the NHS is not good, there is sometimes a bullying culture and I have been exploring ways we can learn the lessons from mutualism, so staff have a say in their organisations.